Winchester & District Badminton Association and EasierThan understand that your privacy is important to you and that you care about how your personal data is used and shared online. As such, Winchester & District Badminton Association will only collect and use personal data in ways that are described here and within any specific policies within the Documents and Downloads page of this website, and in a manner that is consistent with their obligations and your rights under the law. Please read this Privacy Notice carefully and ensure that you understand it. Your acceptance of this Privacy Notice is deemed to occur upon your first use of the Winchester & District Badminton Association website. If you do not accept this Privacy Notice, please stop using this website immediately. For all enquiries relating to your personal data, please contact the Data Protection Officer or other key representative for Winchester & District Badminton Association as listed on the Officers page of this website. This Privacy Notice explains how Winchester & District Badminton Association use your personal data on this website. How it is collected, held, processed and published. It also explains your rights under the law relating to your personal data. Specific policies within the Documents and Downloads page of this website may also detail how Winchester & District Badminton Association use your personal data offline or store it electronically elsewhere. Personal data is defined by the General Data Protection Regulation (EU Regulation 2016/679) (the GDPR) as "any information relating to an identifiable person who can be directly or indirectly identified in particular by reference to an identifier". To see what personal data Winchester & District Badminton Association collect and use, please refer to What Personal Data Do You Collect? below. The right to be informed about Winchester & District Badminton Association's collection and use of your personal data. The right to access the personal data Winchester & District Badminton Association hold about you. The right to have your personal data rectified if any of your personal data held by Winchester & District Badminton Association is inaccurate or incomplete. The right to be forgotten, i.e. the right to ask Winchester & District Badminton Association to delete, anonymise or otherwise dispose of any of your personal data that they hold. The right to restrict (i.e. prevent) the processing of your personal data by Winchester & District Badminton Association. The right to object to Winchester & District Badminton Association using your personal data for a particular purpose or purposes. The right to data portability. Obtaining a copy of your personal data from Winchester & District Badminton Association to re-use with another service or organisation. If you have any cause for complaint about Winchester & District Badminton Association's use of your personal data, please contact the Data Protection Officer or other key representative and they will do their best to resolve the issue. If Winchester & District Badminton Association are unable to help, you also have the right to lodge a complaint with the UK's supervisory authority, the Information Commissioner's Office. Specific policies within the Documents and Downloads page of this website may also cover personal data (such as membership details and fee payments) collected and stored elsewhere by Winchester & District Badminton Association and its representatives. Under the GDPR, Winchester & District Badminton Association and EasierThan must always have a lawful basis for using personal data. All personal data collected, stored and published on this website is for the purposes of running and promoting Winchester & District Badminton Association and it is the responsibility of Winchester & District Badminton Association and its representatives to obtain consent for it to be used in this way. The remaining above details are used to provide access to and within the Admin area of this website and are accessible to specific representatives with specific roles involved in the running of Winchester & District Badminton Association. Publicly available personal data may be displayed in, but not limited to, Clubs pages, League Appearances, News items, association Coaching, History, Officers and Committees information, along with any of the downloads published within Documents and Downloads. Neither Winchester & District Badminton Association nor EasierThan use the personal data on this website for targeted advertising or marketing purposes, nor do they supply it to third parties to do so. Currently, all communication, such as emails sent from this website are only ever related to use of this website or the running of Winchester & District Badminton Association. 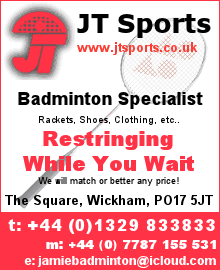 At a future date, should Winchester & District Badminton Association or EasierThan begin supplying you with other information by email, SMS text message or post, it will be a service that you have opted-in to and may easily unsubscribe from or opt-out at any time using the technology in question. You will not be sent any unlawful marketing or spam from Winchester & District Badminton Association or EasierThan and they will always work to fully protect your rights and comply with their obligations under the GDPR and the Privacy and Electronic Communications (EC Directive) Regulations 2003. As a record of the history of Winchester & District Badminton Association, some data collected may be held and displayed indefinitely on this website. Such data might include appearances, news items and historic tables including cup winners or past presidents. Data relating to positions within the association, most commonly contact data for officers, committee members, secretaries, club and team reps, will be held and displayed on this website for the length of time the person in question holds said position. If you believe personal data on this website is out-of-date and should no longer be displayed, please contact the Data Protection Officer or relevant representative of Winchester & District Badminton Association. How and Where is My Personal Data Stored or Published? In providing this website to Winchester & District Badminton Association, EasierThan will only be storing or publishing your attached personal data on hosting services within the UK and European Union. This means that your personal data will be fully protected under the GDPR or to equivalent standards by law. Hiding email addresses behind a button click to prevent harvesting by SpamBots. The addition of a "NOINDEX" meta tag to the Appearances pages to prevent Google indexing. Encrypting the storing of said passwords in the database. Website and database design created to minimise the likelihood of unauthorised hacking. UK based hosting with an established, well-rated provider who regularly maintain their server software, anti-virus and firewall protection across mirrored data-centres. Note however, as listed above (see How Is My Personal Data Used?) much of the personal data held is published publicly on this website. As such, EasierThan can accept no liability for its subsequent misuse by third parties and it is the responsibility of Winchester & District Badminton Association and its representatives to obtain consent from yourself to publish it. It is acknowledged by EasierThan that an SSL certificate providing secure access via "https" to the Admin area of this website would be beneficial, but the cost factor and development time involved would require additional funds be sought from Winchester & District Badminton Association. It is hoped that with further take up of the BaddersWeb system, this feature will be added. In reality, the weakest point of the Admin function is its user's own passwords and the security (or lack thereof) of their devices. Where a breach of security occurs through use of a valid password or already logged in device, the offending account can quickly be locked out by a Winchester & District Badminton Association representative simply by changing the user's password or making them "Not Current". In such circumstances, EasierThan will endeavour to assist where possible, but can accept no liability for any issues arising from the breach. It would be the responsibility of Winchester & District Badminton Association to make members aware of any personal data concerns. The BaddersWeb system has no access level that let's a user see another user's password. As detailed in How Is My Personal Data Used?, much of the personal data held on this website is published publicly on it. This means that it is by default shared with the world, accessible to Google and other search engines to be indexed and searched upon and by anyone who accesses this website. Neither EasierThan, nor Winchester & District Badminton Association and its representatives share any of the non-public personal data for any purposes other than running and promoting Winchester & District Badminton Association, unless detailed within any specific policies within the Documents and Downloads page of this website. If any of your personal data is shared with a third party by Winchester & District Badminton Association or its representatives, they will take steps to ensure that your personal data is handled safely, securely, and in accordance with your rights, their obligations, and the third party's obligations under the law. In some limited circumstances, EasierThan or Winchester & District Badminton Association may be legally required to share certain personal data, which might include yours, if involved in legal proceedings or complying with legal obligations, a court order, or the instructions of a government authority. It is the responsibility of Winchester & District Badminton Association and its representatives to obtain consent for your personal data to be used, stored and published on this website for the purposes of running and promoting the association. However, this does not affect your rights under the GDPR (see What Are My Rights? ), whereby you can request that some or all of your personal data is not stored or published on this website or that specific personal data is removed or amended. As detailed previously, publicly available personal data on this website may be displayed in, but not limited to, Clubs pages, League Appearances, News items, association Coaching, History, Officers and Committees information, along with any of the downloads published within Documents and Downloads. If you wish to control any of your personal data on this website, please contact the Data Protection Officer or other key representative of Winchester & District Badminton Association. Under the GDPR you have the right to withold personal data entirely, but consideration needs to be given as to the impact on the running of Winchester & District Badminton Association. For example, is it feasible to be an Officer or Committee member of the association without publishing contact details? Likewise, In the instance of Appearances, the BaddersWeb system offers options for names to be displayed as: "Full Name", "Initial and Surname", "Surname Only", "Initials Only" or "Not Displayed". However, if every registered player opted for "Initials Only" or "Not Displayed", it would make somewhat of a nonsense of the facility. Simply replace [Your Data] with your surname, phone number, street address or email, etc.. Note, as detailed in Is My Personal Data Secure?, Appearances pages might not be indexed and therefore won't show up in a search. If you want Winchester & District Badminton Association to tell you what personal data is held about you, you can submit a Subject Access Request. A Subject Access Request is a written request sent to the email or postal address of the Data Protection Officer or relevant representative of Winchester & District Badminton Association. There is not normally any charge for a Subject Access Request, but if your request is "manifestly unfounded or excessive" (for example, if you make repetitive requests) a fee may be charged to cover Winchester & District Badminton Association administrative costs in responding. Winchester & District Badminton Association will respond to your Subject Access Request as soon as possible, but given that personal data on this website may be displayed in, but not limited to, Clubs pages, League Appearances, News items, association Coaching, History, Officers and Committees information, along with any of the downloads published within Documents and Downloads, sufficient time should be allowed up to a maximum of three months from the date the request is made. A cookie is a small file placed on your computer or device by the BaddersWeb system when you visit certain parts of this website and / or when you use certain features of this website. This is an industry standard way for websites to maintain things like logins, personalisation, shopping baskets, etc.. This BaddersWeb system website may place and access certain first party cookies on your computer or device. First party cookies are those placed directly by a website and used exclusively by that website. All cookies used by and within this website are used in accordance with current cookie law, namely the relevant parts of the Privacy and Electronic Communications (EC Directive) Regulations 2003 and the GDPR. Certain features of this website depend on cookies to function. Cookie law deems these cookies to be "Strictly Necessary". These cookies and their purpose will not be detailed anywhere as to do so represents an opportunity for hackers to learn about and understand the BaddersWeb system. Your consent will not be sought to place these cookies, but you may still block these cookies by changing your internet browser's settings as detailed below in Can I Control Cookies?. However, please be aware that this website may not work properly if you do so. In addition, this website may use analytics services provided by Google. Website analytics refers to a set of tools used to collect and analyse anonymous usage information, enabling Winchester & District Badminton Association and / or EasierThan to better understand how this website is used. Whilst use of them does not pose any risk to your privacy or your safe use of this website, you do not have to allow the collection of these third party cookies if you do not wish. Please see Can I Control Cookies? below. You can choose to enable or disable cookies in your internet browser. Most internet browsers also enable you to choose whether you wish to disable all cookies or only third party cookies. By default, most internet browsers accept cookies, but this can be changed. Please remember to replace [Your Browser] with Firefox, Chrome, Edge, Safari, etc..
You can choose to delete cookies on your computer or device at any time, however you may lose any information that enables you to access this website including, but not limited to, login and personalisation settings. How Do I Contact Winchester & District Badminton Association? To enquire about anything to do with your personal data and data protection, please contact the Data Protection Officer or relevant representative of Winchester & District Badminton Association. EasierThan may change this Privacy Notice from time to time. This may be necessary, for example, if the law changes, or if EasierThan makes changes to the BaddersWeb system in a way that affects personal data protection. If you are concerned, we recommend that you check this page regularly to keep up-to-date.